He spent most of question period on his feet. Finance Minister Bill Morneau stands during question period in the House of Commons on Oct. 23, 2017. OTTAWA — The opposition continued to hammer Finance Minister Bill Morneau Monday over his apparent conflicts of interest — his failure to divest himself of millions of dollars of stock in his family's company, his failure to avoid tabling legislation that furthered his company's interests, and his failure to uphold the ethical standard the Liberal government had set. "As a $20 million shareholder in [Morneau Shepell], the finance minister stood to profit from his own [pension] bill," Conservative finance critic Pierre Poilievre charged in question period. "Did he have have permission from the ethics commissioner to introduce a law that would profit his own company?" NDP parliamentary leader Guy Caron quipped that he teaches his children how to take responsibility for their actions and that he was ready to offer his services to the finance minister. "This government promised Canadians higher ethical norms," Caron said. "Where are those higher ethical norms?" 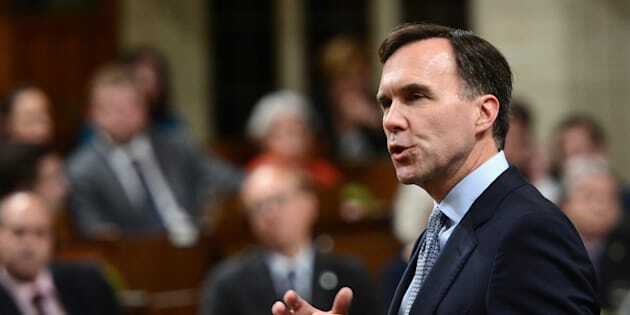 With Prime Minister Justin Trudeau not in the House of Commons, Morneau spent most of the hour on his feet, repeating — no matter the question posed: "I know the members opposite are going to continue to focus on my personal finances. I'm going to going to focus on the finances of Canadians." He later added that the opposition was "obsessed" with his personal finances. "Mr. Speaker, all of us on this side of the House are living up to the highest standards of integrity," Morneau also said, prompting the opposition to erupt in laughter. The government is focused on helping the middle class do well, so they can spend more money and help the economy do well, the finance minister said. "That virtuous circle is what we are focused on," he said, to more laughter. "There is nothing virtuous about a circle where the finance minister uses his power to make decisions to benefit himself and his family," snapped Conservative MP Shannon Stubbs. Earlier in the day, the NDP introduced a motion calling on Morneau to "apologize to the House and to Canadians for breaking their trust" and on the government to close loopholes in the Conflict of Interest Act to prevent ministers from personally benefiting from their position, or from even creating the perception that they could. "Clearly, there is a gap in the law that has been exploited by Mr. Morneau," NDP ethics critic Nathan Cullen told reporters. Cullen had returned from his northern B.C. riding where, he said, he heard from members of the business community who are furious with Morneau. "They have been accused for four, six months now of unethical loophole behaviour, Cullen said. "Meanwhile all the time, the finance minister was actually conducting himself that way." NDP MP Nathan Cullen, right, and NDP parliamentary Leader Guy Caron take part in a press conference in the foyer of the House of Commons on Oct. 17, 2017. Cullen stopped short, however, of calling for Morneau's resignation. "I get a sense from Canadians that they would be willing to forgive — but not forget — and also require that things improve," he said. The NDP wants to address two specific loopholes: one that doesn't force public holders to divest or to place their assets in a blind trust if they are owned through a holding company rather than directly; and another that allows public office holders to take part in discussions and decision making if matters relate to "general application" rather than a very specific interest. This is likely the loophole Morneau used to table pension legislation, C-27, while he still held millions of dollars worth of shares in Morneau Shepell, his family's pension management business. Journalist David Akin has noted that Morneau has made at least $1.6 million off the Morneau Shepell stock since becoming an MP. The Conservatives on Monday also called on Morneau to divulge what other assets he holds in various numbered companies. "No one has more power to enrich a company and its shareholders than the finance minister," the Tories said in a statement. "With these massive financial powers should come absolute financial transparency." Morneau broke the rules, the statement said, when he failed to report an offshore private corporation that held a French villa, and "only when he was caught did he disclose his offshore private corporation and offer to put his assets in a blind trust. "This leaves Canadians to wonder, what else are the finance minister and Justin Trudeau hiding?" The NDP's opposition motion — which is supported by the Conservatives — will be voted on Tuesday afternoon. that Morneau, after his election in 2015, allowed Canadians to believe he had placed his shares in his family's company, Morneau Shepell, into a blind trust, without ever having done so. and that he failed to live up to the ethical standard set by the prime minister in his mandate letter to the ministers. Morneau's mandate letter, like those of his ministerial colleagues, noted that he needed to "uphold the highest standards of honesty and impartiality, and both the performance of your official duties and the arrangement of your private affairs should bear the closest public scrutiny. "This is an obligation that is not fully discharged by simply acting within the law."